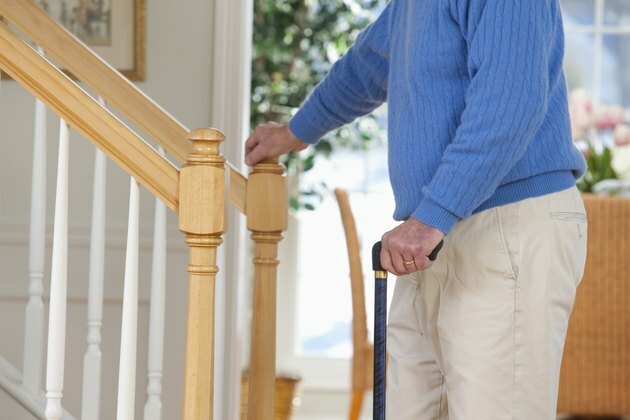 Going up and down the stairs is something many people take for granted, however, many seniors are unable to it without a lot of difficulty. Fortunately, you can buy mobility assistance products for temporary or permanent installation to help the elderly regain their independence and move from floor to floor. Senior man standing at bottom of stairs with cane. This device is a quality handrail that has a supporting rail attached to it. The StairSteady slides when pushed and locks when weight is applied to it. The person using it holds on to the device to go up or down the stairs safely at their own pace. The rail part of the device attaches to the wall of your staircase. Its handle locks into place whenever pressure is applied so that that the person is able to rest when needed. This stair assistance step looks somewhat like a cane but it has a four point plastic base on the bottom. The gadget actually adds a step in between stair risers so that the person does not need to step so high. The person moves the EZ Step device one step at a time up or down the stairs reducing strain on knee joints. Electric stair lifts are installed on your wall beside a staircase to transport disabled or elderly people up and down the stairs. You can purchase a new or reconditioned stair lift, or you can rent one. The person using a stair lift presses a button and remains seated while the stair lift does all the work. you can also purchase or rent wheelchair stair lifts to accommodate people in wheelchairs. The iBOT Mobility System, a special wheelchair made to climb stairs, was introduced in 2003. Wheelchair-bound elderly and disabled people appreciate the independence afforded by device -- no assistance is required to operate it, whether on the ground or climbing stairs. The iBOT requires a physician's prescription, and the person for whom it is intended must be assessed at an iBOT Evaluation Center. What Is the Difference Between Steps & Stairs?